2010 Haridwar Kumbha Mela, photo by Edson Walker, Wikimedia Commons. In Part One of ‘Kumbha Mela and the Reestablishment of India's Truth and Power in the World’ I presented some basic information about the Kumbha Mela along with Thea’s thoughts on the chronic miscalculation of the dates of this zodiacal festival and the problem this poses for India. In Part Two I will discuss this miscalculation or mismeasure of the Kumbha Mela in greater depth, and in Part Three I will discuss the geometric sense of the Kumbha (the Water Pot, Jar or some say Urn) which is the key to the correct measure of the zodiacal year and hence the key to the correct measure and sense of the Kumbha Mela. ‘Is [shraddha] analogous to “faith” as defined in the English language? According to the Oxford dictionary, “faith” is a “strong belief in the doctrines of a religion, based on spiritual conviction rather than proof”. In this case, spiritual conviction is merely seen and understood through a scientific lens, thus requiring proof for its validation. While in Sanskrit etymology, shraddha is made of two words, srat which means heart and dha that means to place – taken together, they mean to put one’s heart to. This stands in direct contradiction to the Western understanding of faith, which seems to signify a blind belief based purely on spiritual conviction. I very much agree with Ms. Awasthi that there is a deeper meaning underneath the Kumbha Mela celebration, as well as other underneath all Hindu myths, symbols and traditions, to be seen and known; but I also feel it is extremely important to not abandon this meaning to the transcendental (non-physical) realm ‘beyond the realms of science and proof’ and beyond rational human comprehension. It is important to reestablish the real basis, sense and essence of our world’s religions in our material realm (Earthly and Cosmic). Otherwise there is no real possibility of achieving the Union that is the original essence of the words Religion and Yoga. Religious faith, conviction or shraddha may unify certain groups of people, but on the world scale, it functions (and has functioned for millennia) as a force of division, not a force of unity. When this faith, conviction or shraddha is static and rigid or simply tamasic, as it often is, it functions as a de facto barrier or wall in the way of the real Yoga (Yajna) and Science of discovering the hidden truths of our Soul and our Matrix. People tend to defend and propagate their set beliefs to the exclusion of all reason and without any real will to peel back and see beyond, grow beyond the layers of their own, often inherited, belief system and their own ignorance. As human consciousness evolves, this insular tendency will give way to the capacity and the desire to alter, amend and reverse set beliefs based on higher truth – based on truth that integrates and unifies. In her article, Ms. Awasthi touched upon the real yogic basis and higher (Vedic) significance of the Kumbha Mela. She hailed the ‘precise calculations of solar cycles’ which determine the dates of the Mela as proof of its higher or reality-based significance. I take it Ms. Awasthi was referring to the Sidereal (Nirayana) measure of the Sun’s cycles, but it is the fixed ‘solar cycle’ of the Earth’s Tropical (Sayana) Year that is the singular context and unified field wherein the higher and ancient sense of the Kumbha Mela (along with all Hindu symbol, myth and holy days or festivals) is to be found. This is the 12-month, 360° Vedic Year or Yajna, better known to people across the world as the Zodiac. I recently read an article by Molly Hall, in which she described the Zodiac as the ‘earliest known ordering of existence, long before recorded history’. She also mentioned that study of the Zodiac, i.e. Astrology, has long been called ‘the Mother of all Sciences.’ This ancient association of the Zodiac with ‘the Mother’ and simultaneously with knowledge hails from the Rig Veda wherein the Zodiac is known as Aditi, the Mother of the Gods, equated with ‘all that hath been born and shall be born’ [RV 1.89.10, tr. RTH Griffith]. 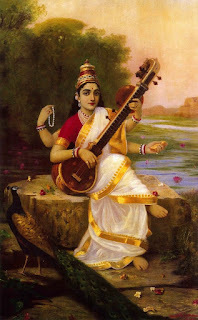 She is often mentioned in conjunction with Eternal Law (Sanatana Dharma). In Rig Veda 8.25.3 she is called ‘Mighty Mother, true to Law’ [tr. RTH Griffith]. In Rig Veda 7.87.7 the Rishi prays, ‘While we are keeping Aditi's ordinances. Preserve us evermore, ye Gods, with blessings’ [tr. RTH Griffith], alternately translated as: ‘May we grow in riches following the law of workings of Aditi, the infinite mother’ [tr. R.L. Kashyap]. According to Sri Aurobindo the 12-month Year/Yajna is the basis of the entire plot or Hero’s journey of the Rig Veda. He recognized that the passage into and through the 10th month of this sacrificial Year, as described in the Vedic hymns, is a symbol of the evolution of consciousness into the divine realm of Swar – the realm of Truth and Unity Consciousness – by the Vedic heroes and heroines. For the Rishis and for Sri Aurobindo, this divine realm was to be realized on Earth, not beyond it. Thea recognized and expounded upon the zodiacal basis and context of Rig Veda. She understood that the fourth world of Swar in the Vedas is equivalent to the fourth quadrant of the Zodiac encompassing the 10th, 11th and 12th signs ‒ Capricorn (Makar), Aquarius (Kumbha) and Pisces (Meena). She shed great light not only on Vedic symbols and lore, but also on post-Vedic symbols and lore. In short, she fully exposed the truth that the basis of the Rig Veda and thus the original basis of the Hindu belief system, along with the all of its varied symbols, mythology and celebrations, including the Kumbha Mela, is the Earth’s 12-month Solar Year, aka, the Zodiac. Thus it makes perfect sense that a primary component of Hinduism is the frequent celebration of festivals or holy days and weeks, on specific days of the sacred calendar year or Yajna. The problem that Thea brought to light, of which Ms. Awasthi seems to be unaware, is that some thousand years ago, India adopted the un-Vedic or post-Vedic Sidereal (Nirayana) measure of the sacred calendar year which is approximately 20 minutes longer than the Earth’s Solar/Tropical Year or cycle. It is due to this difference (based on the 25,920-year Precession of the Equinoxes) that the entrance into the 10th sign of Capricorn (Makar Sankranti) is now celebrated 23.5° (equivalent to 23.8 days) after the Sun’s entrance into the sign of Capricorn (Makar) according to the Earth’s Solar/Tropical Year. By this miscalculation of the Vedic Year, the date of entrance into the sign of Capricorn will drift further and further away from the December Solstice at the rate of approximately 1 day every 72 years. In her article, Ms. Awasthi uses the Makar Sankranti start date of the Kumbha Mela as evidence of the scientific underpinnings of the Kumbha Mela. Whereas it is absolutely true that Makar Sankranti or entrance into the sign of Capricorn IS permanently linked to Uttarayan (the beginning of the upward movement of the Sun in the Northern hemisphere); it is entirely false and unscientific to propose that Makar Sankranti/Uttarayan happens on any date of the Earth’s Solar Year other than the December Solstice. This glaring problem arises solely due to the current practice in India of measuring the Vedic Year (i.e. the Zodiac), according to the position of the constellations which shift backwards in relation to the Earth’s Zodiac whose four Cardinal Points are firmly established by the Equinoxes and Solstices. The four Cardinal Points of the Earth’s Solar/Tropical Year fall precisely on the March Equinox (0° Aries), the June Solstice (0° Cancer), the September Equinox (0° Libra) and the December Solstice (0° Capricorn). On the June Solstice (0° Cancer), the Sun’s rays shine directly upon the Tropic of Cancer at 23.4° N Latitude, and then the Sun begins its movement southward. On the December Solstice (0° Capricorn) the Sun is directly overhead the Tropic of Capricorn at 23.4° S Latitude, and then begins its movement northward (Uttarayan). For more on the history of this problem, see my last post. Due to the Indian practice of following the backwards shift of the constellations, Makar Sankranti (0° Capricorn), and the beginning of certain Kumbha Mela celebrations (such as the present Prayagraj Ardha Kumbha Mela) are celebrated 24 days after the actual date of Makar Sankranti and Uttarayan when the Sun reaches the Tropic of Capricorn and begins its journey north. If Indians continue to align with the backwards slippage of the Sidereal Year they will eventually find themselves celebrating the entrance into Capricorn and Uttarayan in the Summer and in the Fall, when the Sun’s direct rays are actually heading southward from the Tropic of Cancer. In the quote above from Ms. Awasthi’s article, I emphasized the text: ‘the Kumbh is accurately designed to fall on the dates marking the sun’s transit to Capricorn, thus signifying the end of the winter solstice.’ I am not exactly sure what the author means by the phrase ‘the end of the winter solstice’. The truth is that the Sun’s transit into 0° Capricorn is equivalent to the Winter Solstice, at a precisely measurable moment and day each year circa 21-22 December. Given that the 2019 Prayagraj Ardha Kumbha Mela began on 14-15 January 2019, 24 days after the Winter Solstice, I am not sure how the sentence in bold above makes any real sense, scientific or otherwise. There is a departure from logic and confusion here based on India’s long-standing departure from the Vedic measure of the Earth’s Solar Tropical Year. This is a critical problem when asking people to consider the scientific sense of the Kumbha Mela and other Hindu traditions in order to uplift the deeper sense of these sacred traditions. The true scientific and yogic basis and solid foundation of the ancient wisdom of the Vedic Rishis, upon which Hinduism is originally based, is the Earth’s 12-month year as measured out by the four Cardinal Points of the Earth’s year. 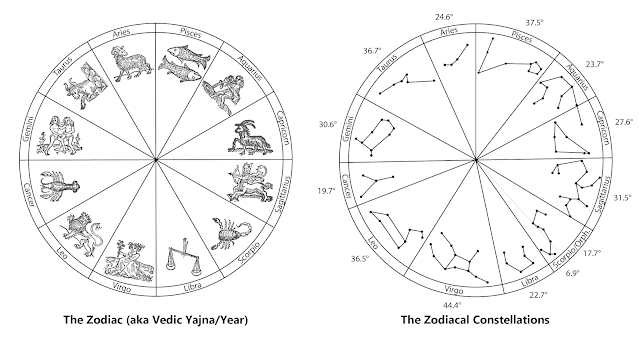 The image above which shows the dramatic contrast between the geometry and measure of the 12-month Zodiac/Vedic Year and the uneven imaginative distribution of the zodiacal constellations that have been projected upon the 360° ecliptic. In the first image we see the proper harmonious Vedic division of the 360° year whereby each of the 12 months are precisely 30° each. In the second image, we see the uneven and haphazard division of the ecliptic as marked out by the constellations. 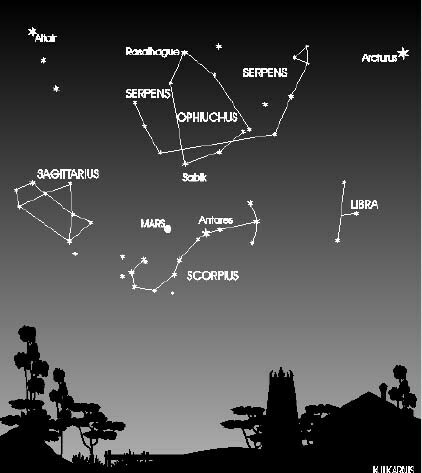 In the image showing the distribution of the zodiacal constellations, we can see that the span of each of the 12 signs (13 if you add Ophiuchus) varies widely and the four quadrants of this imaginary Zodiac span approximately 91.9°, 100.6°, 78.8°, 88.8°. Hopefully it is not too difficult for readers to see that the arbitrary and uneven divisions of the constellational zodiac have nothing to do with the eternal geometric laws and harmonies of the circle which are the basis of creation and of life on Earth, as well as the basis of the Rig Veda. The measure of the Zodiac may seem inconsequential to people who flat out reject that there is any real logic or sense to the ancient celebration of the zodiacal year; but for the hundreds of millions of Hindus who want the world to understand that there is real truth underlying their faith or shraddha and their extraordinary holidays and festivals, the mismeasure of the Sacred Year is a real problem. As soon as Indian astrologers began to look for the sankrantis (entrances) of the 12 months of the Zodiac in the distant constellations of stars along the ecliptic (approximately 1,000 years ago according to Thea), the solid, real, ancient and Vedic basis of Hinduism was tossed aside. Having lost the sense of Earth’s own sacred measure or divine maya, India’s Hindu population has become fully dependent on astronomers, priests and pundits to determine for them the correct measure of the Year and its holy days. Historically and in modern times many self-proclaimed authorities have had different ideas about which star to point to as the basis for determining the zero point (0° Aries) of the Sacred Year. Who are people to believe? As a result most Indians find themselves in the disempowered position of being unable to ‘comprehend the [sacred calendar] and the choosing of the correct dates’ . They depend on pundits, priests and astronomers rather than on the Earth’s own truth or svadha, the truth of her Soul, to determine and communicate the correct measure and sankrantis of the sacred year. It all amounts to a grave imposition (led by male ‘authorities’) upon the truth of the Divine Feminine. This reminds me of how, for some 1,000 years, throughout the European Middle or Dark Ages [5th to 15th centuries], up until the Protestant Reformation [1517-1648], the Christian masses were prevented from reading the Bible by male priests and church authorities, in order ‘to control and restrict the teachings and to enhance their own power and importance.’  Hindus will experience their own historic reformation and empowerment once they repossess the Vedic Yajna or Year with no interference and distortion of intermediaries, realigning the sacred calendar with the ancient ritam and rhythm of Mother Earth. The zodiacal constellations do serve as important points of reference in terms of navigation, orientation within the cosmos and in terms of tracking the 25,920-year Precession of the Equinoxes (i.e. the 'Great Year'); but the way the zodiacal constellations have been constructed can hardly be considered scientific. The constellations are not REAL. The stars are of course real, but the connect-the-dot zodiacal figures in the sky are not real. They amount to an imaginative projection of the Zodiac (the Earth’s 12-month Year) onto the brightest stars along the Earth’s ecliptic plane. The real Zodiac (aka the Earth’s ‘Circle of Life’) is simply and permanently based on the scientific measure of the Earth’s four Cardinal Points, establishing the four seasons of the Sacred Year/Yajna, which are further divided into three months each, as established in the Rig Veda. If human memory were suddenly wiped away, so would be the zodiacal constellations. What would not be wiped away, would be the basic reality of the Earth’s year ‒ its four Cardinal Points and its four seasons. The cycle or Circle of Life that is dependent on the Earth’s tilt and her relationship with the Sun would not suddenly disappear. What would also not be wiped away is the eternal truth (Sanatana Dharma) and geometry of the circle wherein the radius divides the circle into 12 even segments. The image to the right displays the geometry of the 12 division of the Circle/Zodiac. 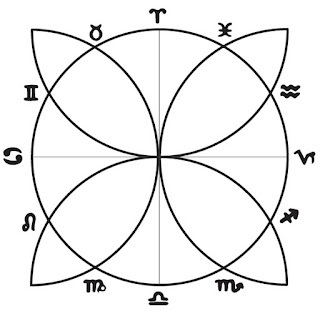 Each of the four arcs (vesicae piscis) that form the four petals of the circle are drawn by arcing the radius of the circle from the four Cardinal Points, dividing the four quadrants (seasons) into three even segments (months). If humans had no memory of the constellations as currently composed, and were once again compelled to cluster stars together as cosmological and navigational reference points, the constellations would naturally be clumped together and measured out very differently than they are arranged today according to some new application of human rationale and imagination. The 12-month Yajna/Zodiac of the ancient seers, however, does not depend on human rationale and imagination. It is set or fixed by the geometry of the Earth’s relationship with the Sun and by the geometric laws of the radius and the circle, which I will discuss in more depth in Part Three. Whereas these features of the Earth’s Tropical Year are clear enough and are supported by scientific evidence, it is quite a stretch to imagine that the Sun’s passage, or the Moon’s or any planet’s passage across an arbitrarily determined sankranti point in the constellations have anything to do with the Earth’s biological systems or its electromagnetic field. If there is evidence that the Solar, Lunar or planetary transits across the Sidereal cardinal points and through the Sidereal months have a real effect on the Earth’s biology and magnetic field, I would very much like to see it. For that matter, I would also like to see any scientific evidence suggesting that the planetary transits across the Tropical Cardinal points and months have some real effect on the Earth’s biology and electromagnetic field. The Sun and the Moon’s transits through the Tropical Year clearly have a scientifically verifiable effect on life on Earth, but I have seen no evidence that this is true for planetary transits. Of course those of us who study astrology find credible evidence of such planetary effects in the cycles, events and laboratory of our own lives, but this does not count as scientific evidence. If one thinks of our Solar System as a Solar Cell, it is not that much of a stretch to imagine that the geometry, gravity and electromagnetic fields of the orbiting particles within this cell have some real effect on each of the particles. There is some scientific evidence suggesting that together the orbits and gravity of Jupiter and Venus effect vast (405,000-year) climate cycles on Earth,  but as is, I don’t believe that this evidence shows any influence of Jupiter and Venus on Earth’s climate or biological systems in relation to the Earth’s Tropical/Solar Year. Perhaps the effects of the relationship between the Earth’s Tropical Year and the other planets of our Solar System must ultimately be researched and understood in terms of the Quantum Realm and Quantum Entanglement. There seem to be a few inconsistencies and disagreements with regards to what planetary alignments must accompany any given Kumbha Mela. Below is an image of the various ways the Kumbha Mela dates are determined (via Sidereal calculation), according to the editors of Wikipedia’s Kumbha Mela page. I looked up the dates of the 2010 Haridwar Kumbha Mela and it apparently began with the Sun’s entrance into Capricorn which does not match up with the information given above. This is quite confusing. For some reason, the Moon’s position is not given for the Haridwar Mela. It appears that at Nashik and Ujjain Melas, the Moon is designated as a ‘New Moon’ (Amavasya), but at Prayagraj the Moon doesn’t have to be exactly new, just in the same sign as the Sun. The Moon moves through each sign of the Zodiac in approximately 2.5 days, so the window for the Sun and Moon to be in any given sign together is 2.5 days. The timing or measure of the New Moon is more precise, as it can be narrowed down to the minute of a particular day. I believe the alternate position of Jupiter given for the Prayagraj Mela can be cleared up via the fact that the Ardha (Half) Kumbha Mela in Prayagraj falls 6 years after the Purna (Full) Kumbha Mela in Prayagraj. So whereas Jupiter would be in Taurus for the Purna Prayagraj Kumbha Mela, 6 years later Jupiter would have traveled through 6 signs, into the sign of Scorpio for the Prayagraj Ardha Kumbha Mela. I do not understand the logic of the two different options given for the timing of the Nashik and the Ujjain Kumbha Mela. As discussed by Sri Aurobindo and Thea, the Navagvas and Dashagvas refer to the 9th and 10th rays or months of the Sacrificial Year. In my mind, ‘Indra the friend’ in RV 3.39 is connected to 11th month of Aquarius the Friend. In zodiacal lore, it is the sign of Aquarius the Friend or Water Bearer who pours the purifying waters or heavenly rivers of truth out of his kumbha (jar) onto Earth, thereby purifying humanity of its 'sins' (i.e. its ignorance). The Kumbha Mela celebrations along the sacred rivers of India stand as a symbol of this purification, depicted in the Vedas as the purifying release of the sacred waters (rivers) from the mountain of Capricorn (Makar) and from the pot, pitcher or water jar (Kumbha) of Aquarius. I will discuss the geometric sense of this Kumbha as well as the descending rivers and waters of the Vedas (within the Zodiac) in Part Three. The four major Kumbha Mela festivals would be extremely simple to calculate if their start dates were marked out precisely according to the four times within each 12-year cycle when Jupiter enters into one of Vishnu’s four preservation signs (Taurus, Leo, Scorpio and Aquarius). It would also be simple to calculate if each of the four Melas were held consistently upon the entrance into the cardinal sign of Capricorn (Makar Sankranti). It would also be simple to calculate if each of the four Mela’s were held upon the Sun’s entrance into each of the four cardinal signs of Zodiac (covering all cardinal bases so to speak) during the years when Jupiter falls in the four fixed signs of the Zodiac. As readers can see from the image above, it almost works out this last way, but not in precise accordance with the Sun’s entrance into the cardinal signs due to the tradition of also incorporating the Sun’s conjunction with the Moon (in three of the four Kumbha Mela celebrations). There seems to be some leeway or variance as to whether or not the Ujjain Mela is held when the Sun is in Aries or Libra, or whether Jupiter is in Leo or Libra. If all four fixed signs, and all four cardinal points were to be fully represented throughout all four Purna (not Ardha) Kumbha Melas, then the calculations would have to be altered slightly to eliminate a couple of the options as shown above, and to set the celebrations in Ujjain to correspond with the transit of Jupiter in Scorpio. This would be quite a precise calculation and celebration of the four fixed signs of Jupiter’s 12-Year cycle, in conjunction with the four cardinal signs of the Earth’s 12-month Year. It would be even more precise if the date of the New Moon was consistently designated as the start day for all four events. In this version or alteration of the astrological determinations of the four Purna Kumbha Melas, Jupiter would actually move through all four of the fixed signs of the zodiac in the right order through the Zodiac. The cardinal signs are not represented in their right zodiacal order. I do know Jupiter is thought to be exalted in Capricorn and in its fall in Cancer, and that the 5th planet Jupiter is seated in the sign of Libra in the Gnostic Circle, but I do not know specifically what the full logic is of the specific Jupiter-Sun pairings for the Melas. As is, the different options given for the Kumbha Mela determination and the absence of Scorpio in the rhythm of the four major Kumbha Melas create a somewhat confusing picture, without a straight forward or complete journey through the Zodiac. According to these determinations, the Ujjain and Nashik Kumbha Melas are likely to fall in the same year or in adjacent years, not in accordance with the even 3 x 4 math or geometry of the 12-year pattern by which Jupiter travels through all four of Vishnu’s preservation signs in the Zodiac. Given that the Kumbha Mela is a 12-year celebration of the four places where Vishnu the Preserver ‘spilled’ the Amrita from his Kumbha, it makes complete logical sense that each of these four holy places would celebrate Kumbha Mela when Jupiter transits through one of the four Preservation signs of the Zodiac. The Ardha Kumbha Mela at Prayagraj (currently in progress) celebrates the occurrence of Jupiter in Scorpio, but it does not fulfill the need for four different locations of the Purna Kumbha Mela where Vishnu’s drops of Amrita fall. Perhaps the sign of Scorpio – which Thea equates with Martanda ‘the Dead Egg son of Aditi’ – is not considered the most auspicious month to celebrate the immortalizing nectar of Vishnu; but, as Thea discussed in her writings, Scorpio is not only the sign of death and the entrapment of the light of Mars/Agni, it is also the sign of the transformation of the Scorpion into the high-flying Eagle (Garuda) of Vishnu. It can also be thought of as the transformation of the poison of the Scorpion into the Amrita of the Gods . If Jupiter’s movement through all four of Vishnu’s preservation signs is to be honored, then Scorpio fully deserves its own Purna Kumbha Mela in the series of four. The larger problem, confusion and lack of scientific precision in the measuring of the Kumbha Mela festivals arises from the ongoing Indian error of calculating the zero point and months of the Zodiac according to the Sidereal (Nirayana) measure. This nature of this problem becomes clear when one considers the large variety of ways the measure of the Sidereal Zodiac is calculated. [See www.Astro.com] There is no such confusion with regards to the Tropical Zodiac. It is simply the four-quadrant, 12-month division of Earth’s Solar Year, starting with the March Equinox. There is no confusion or variation whatsoever in the scientific and precise calculation of the Earth’s Tropical/Solar Year, it is not a measure to be debated over by men. It is the Earth’s own self-law (svadha) and divine measure (maya). For those who attend the Mela, there is an expectation of gaining spiritual purification in the sacred rivers, and yet the formulation of the festival dates is based upon and perpetuates ignorance of the true measure of the sacred calendar. Thus it does not, in truth, have its intended purifying effect on the Indian masses. Rather, it has the disastrous effect of celebrating and perpetuating the error that insinuated itself into India circa 11th century like an invading foreign virus, which has served to disempower the Indian masses. This is the bind India which finds itself in as discussed in Part One of this series. In order to be purified of this mass error, the error must be admitted and corrected. No amount of bathing in rivers is going to do the needful in this regard. Naturally, given how long the current mismeasure has passed as truth in India, the resistance to admitting or correcting this inherited error is massive. On the flip side the purifying effect of correcting this long-standing error will be equally massive. This reversal and reparation will have a purifying effect not only throughout the culture of India and the religion of Hinduism, but it will also have a subsequent purifying effect on other dominant religions and religious cultures throughout the world which need to understand the original Vedic and zodiacal source and sense of their set of beliefs, myths, dogmas and ideas. Once people across the world come to understand this common basis of ancient gnosis and this common journey that we all share, there will be a radical reversal from the movement outwards towards fragmentation (i.e. away from center), to the movement inwards towards the center and truth of our common origin and common evolutionary journey or path in Time and Space. The entire concept of a spiritual path originates from the path (patha in Sanskrit) of the Vedic Yajna (Zodiac) ‒ the singular path of the Vedic gods, goddesses, heroes and heroines, all of whom are expressions of the Divine Singularity which expresses itself in the multiple forms of creation within the Divine Matrix. The Vedic Rishis understood the Year as a unified field and as a real Path of transformation, progressively uplifting and harmonizing the physical, vital and mental and spiritual layers of Being. To them the Year was a real symbol and microcosm of the Earth’s evolutionary or developmental PATH towards realization of unity consciousness. The Kumbha Mela stands as a huge opportunity for India to reset and realign its calendrical celebrations and consciousness with the Earth’s Solar Year and to affect a wide-spread reversal and uplifting of consciousness on the Earth. By this resetting and alignment, India would begin to fulfill her destiny as Vishwa Guru of the World, lighting the Earth’s PATH or way towards the Vedic consciousness of Oneness, as opposed to perpetuating the disastrous, stagnant and toxic religious consciousness whose fruits are divisiveness, fragmentation, ignorance and the compulsion to transcend (i.e. leave behind) life on Earth. A glaring sign that the Kumbha Mela is currently a celebration of a disastrous direction for humanity is that participation in the event is thought to lead devotees ‘one step closer to attaining moksha' , or in other words, one step closer to transcendence and liberation from birth and life on Earth. This is not the true direction or goal of Yoga or Religion. This is the goal and direction of the egoic-mental consciousness that has lost touch with the divine nature of creation (the Divine Mother) and erroneously believes escaping material existence is the highest spiritual goal possible. Sri Aurobindo discussed this spiritual mistake at length in his writings, introducing the higher goal of the Supramental consciousness which is to fully realize the Divine here on Earth, massively transforming the Earth and our life on it rather than transcending it. It does not take much contemplation at all to see that the long-held spiritual ideal of transcending (i.e. abandoning or escaping) Earth’s material reality and denying her divinity as well as the sacredness of her own Circle of Life is leading our civilization to self-destruction via the simultaneous forsaking of and destruction of our own Earthly womb. The ‘spiritual’ response to the material difficulties of life on Earth for quite some time has been to ‘abandon ship’. It must be admitted that the ship wouldn’t be in such critical condition if the Earth’s divine essense was acknowledged and respected first and foremost in our human activities, rather than constantly ignored and transgressed in efforts to transcend her laws. In essence, the Kumbha Mela is a concentrated symbol of the wrong direction of religion wherein, in the process and name of cleansing sins in order to transcend into Moksha or Heaven or the Void, etc., we trash the Divine Earth and the Divine Feminine along with it. If the Earth’s grounds and rivers could speak, would they welcome these swarms of humans to come and dump all of their sins, feces and trash on them and pollute their ecosystem en mass? It is doubtful. But nonetheless the spiritual faith or shraddha that drives the festival, outweighs the consideration of the Earth’s capacity to cleanse itself of the environmental devastation foisted upon it by people who want to achieve Moksha so as to never be reborn on Earth again. It really is a striking symbol of the disaster of the religious consciousness which, in its quest for the Divine Father or Transcendent, abandons and trashes the Divine Mother. The Divine Mother or Matrix of the Earth is also widely trashed as a result of the scientific mindset, just for ‘practical’, monetary and military reasons rather than religious ones. Given this state of affairs by which the Masculine principle dominates and subjugates the Feminine on Earth, it is no surprise that the Kumbha Mela is a male dominated event. According to the BBC, 2013 was the first Kumbha Mela at Prayagraj were women were allowed to bathe at the sacred confluence of the Ganges and Yamuna rivers, known as Triveni Sangam . In 2016 there was trouble with a petition of women ascetics who wanted an allotment of land at the Haridwar Kumbha Mela . I am finding that there is not much information at all on the internet on the issue of women’s inclusion and rights at the Kumbha Mela festival. From the outside, it appears that the media and media consumers in India do not care much about this issue. Click HERE to link to Part Three. This is the translation Thea has used for this passage. I see it all over the web, but no one seems to provide reference to the translator of this important verse. Molly Hall, 30 April 2018 'Understanding the Basics of Astrology'. Most religious holy days and festivals trace back to the sacred tradition, whether Vedic or Pre-Vedic, of acknowledging the sacredness of the Earth’s Solar or Tropical Year, along with its Cardinal Points, seasons and months. This is the amount of time it takes for the Sun to return to a fixed star or point in the constellations of Earth’s ecliptic plane. The difference between the Sidereal or Nirayana measure of the ‘solar cycle’ or Year and the Tropical (Sayana) or measure of the Earth’s Year is due to the 25,920-year Precession of the Earth’s Equinoxes through the 360 degrees of the Earth’s ecliptic plane. Thea discussed the relationship between the 23.5 mismeasure of the Vedic Year and the mismeasure of the Mother’s Temple in Auroville and the 23.4 tilt of the Earth axis in Chronicles of the Inner Chamber, Part Ten, in the sections 'The Cult of 23', 'The Tropics of Cancer and Capricorn' and 'The Core’s ‘Soul of Knowledge’'. Thea believed this departure began circa the 11th century. See: ‘The Origin and Nature of Hindu Decline’ . I constructed the divisions of the 360° circle of the Zodiacal Constellations based on figures given for how many days of the year it takes the Sun to transit across each constellation [from Wikipedia’s Zodiac article]. I included the measurements for Ophiuchus but not the figure of the constellation, which actually overlaps Scorpio quite a bit. [See www.germanicmythology.com] I rounded the numbers to the first decimal place and as a result the tally doesn’t quite add up to a perfect 360. For anyone who wants to know, these numbers shown add up to 360.1. The images of the connect-the-dot constellations are derived from a 123RF.com vector image. This quote is from an Indian man who commented on Part 1 of this series. From ‘Why Christians Were Denied Access to Their Bible for 1,000 Years’, by Bernard Starr, 20 May 2013. This quote was a comment on wattsupwiththat.com. See: http://www.leif.org/research/suipr699.pdf. ; and http://www.leif.org/research/Semiannual-Comment.pdf. See: 'Venus and Jupiter May Meddle With Earth’s Orbit and Climate', Smithsonian Magazine, 9 May 2018. 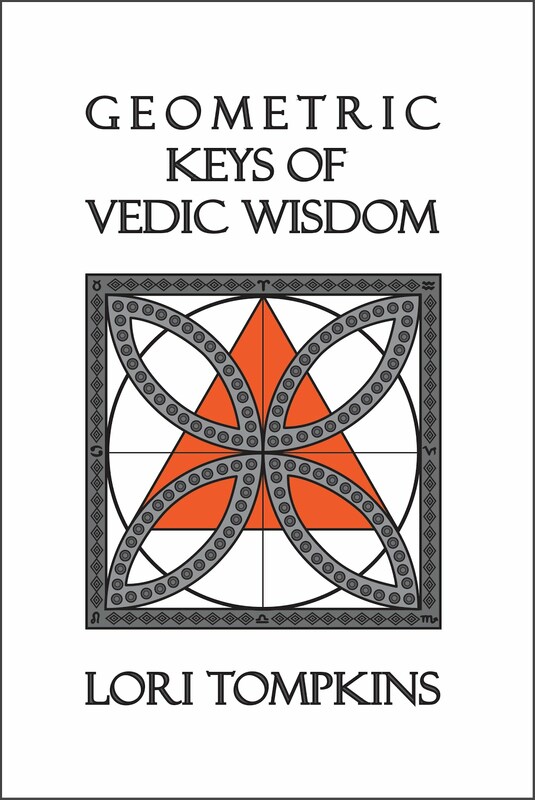 I have written much about the release of the Vedic Rivers in conjunction with entrance into the 11th sign of Kumbha/Aquarius in Geometric Keys of Vedic Wisdom, Part Two. Though Thea discussed the release of the Water Jar (Kumbha) in Aquarius, she did not connect this release of the waters of the Kumbha, with the release of the seven rivers or sacred waters of the Rig Veda. In her view, the victorious release of the seven rivers of the Vedas happens in the sign of Capricorn. In my view, as explained in my book, the symbols and underlying geometry of the Vedas suggest to me that the release of the Rivers and the release of Kumbha happen in the sign of Aquarius, which is known to be the sign wherein the purifying waters of Truth are poured out upon humanity. This is covered at length in my book, and I will also write more about it in an upcoming post or series. 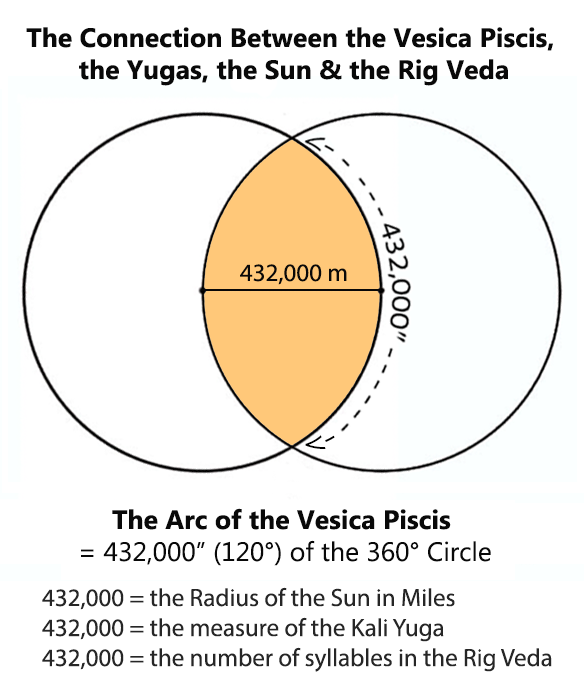 Thea wrote of the connection between Vishnu the Preserver, and the Preservation [Fixed] signs of the Zodiac in The Gnostic Circle (pp. 37, 48); and in The New Way, Vol. 2 (pp. 400-01). This transformation is spoken of in RV 1.191.10-11 ‘I deposit the poison in the Sun, just as a skin-bag is placed in the store-house of liquor. Certainly the Sun does not die, neither do we. Sun, far away on his steeds keeps in touch (with the poison). (O poison), Sun through the Madhuvidya, has rendered you into ambrosia.’ [tr. RL Kashyap] Madhu means honey and is equivalent to the Nectar of Immortality (Amrita) in the Vedas; and vidya means knowledge or science, so Madhuvidya seems to indicate the knowledge or science of Immortality which is obtained by the Vedic gods and heroes. The geometric sense of the ‘skin-bag’ of poison/liquor is equivalent to the geometric sense of the Kumbha, the Amrita and the sacred rivers and waters in the Vedas. They are all symbols of the Vesica Piscis within the Zodiac (i.e. within the Sun’s symbol and circle). In her books, Thea has written of Sri Aurobindo’s role as Vishnu’s 9th Avatar, and about his role in the recovery and restoration of Vedic Wisdom in conjunction with the reestablishment of the true Vedic measure of the Sacrificial Year (Yajna/Zodiac). I have discussed this matter at length in ‘Geometric Keys of Vedic Wisdom’ . See Thea’s series ‘The Origin and Nature of Hindu Decline’ , wherein she discusses the disastrous shift from the Tropical Measure of the Vedic Year, to the Sidereal measure, circa the 11th century. See: ‘Kumbh Mela Destinations’, www.tourmyindia.com. See Logan Plaster’s article ‘The world’s largest gathering left behind an ecological disaster’, 2 May 2013. See: ‘Kumbh Mela: Millions of Indians take holy dip’, by Geeta Pandey, 15 January 2019. See: ‘At Kumbh, a war of sexes between sadhus & sadhvis’, by Sheo S Jaiswal Times of India, 7 Jan 2016.